Youth pastor slays wife, confesses. Why, oh why? On Wednesday, February 15, WSAV News reported that Eric Brian Golden, the 35–year-old Southside Assembly of God youth pastor who killed his wife, was formally indicted on several charges in Chatham County, Georgia (in Savannah). According to the Chatham County Courhouse website, the case was filed on the 15th, and the next event will be a conference hearing on April 20. Hon. Perry Brannen, Jr., is the judge, and Golden is being defended by attorney John P. Sugrue. I don’t know what is typically accomplished at a conference hearing in Georgia criminal courts, but from what I’ve read about other kinds of conference hearings, it will probably provide an opportunity for the court to do some quick work and avoid a trial and also review and litigate possible appeal issues such as how the arrest and confession were handled, and so fort. Since Brian Golden has confessed, unless his confession is recanted or unless there is some critical need to spend taxpayer’s money for a court case, I suspect there may not be one. However, as you can see, Brian has an attorney now (and he didn’t when he made his initial confession), so, who knows? The case is important though to attract the attention of the judge assigned to the case. Savannah native son, Judge Brannen, is actually the Chief Judge of the Eastern Judicial Circuit—who is taking time away from his administrative and oversight duties to hear this case. Brannen’s decision to judge this trial does not bode well for Golden: Judge Brannen, a devout Episcopalian, was awarded the Army Commendation Medal for meritorious service. Judge Brannen served in the Army Security Agency (signals intelligence), attaining the the rank of captain. I can’t imagine a sextegenarian, Anglican, ex-Army judge will go easy on a fellow ex-Army, tongues-talking, neck-breaker. Note, I’m not making an attempt at humor here. Brannen’s a serious judge. Back in November, 2004, Brannen sentenced arson Stuart Vincent Smith to 20 years in prison for attempting to burn down the Cathedral of St. John the Baptist in Savannah. Brannen declared this was “an offense to everyone who lives in this community.” And when a defense psychologist testified that Smith’s vandalism was a “cry for help from 10 years of alcohol dependence and depression stemming from a troubled childhood,” Brannen’s reaction compared Smith’s vandalism to hate-crime and terrorism. And he dismissed the expert testimony: “My assessment is the sum total of all (her) testimony amounts to nothing.” That, too, was a case where the defendant admitted guilt to the police before the trial ever began. Smith didn’t get off easy despite his turbulent past. It will be no easier for Golden either. Actually, I’m pleased that Brannen is hearing this case. Due to his deep involvement in his church, his 42–year marriage, and his meritorious military service, Brannen brings to this case exactly the sentiment and sensitivity it needs to get a fair hearing and a just sentencing. She has left an unfading and unforgotten mark on our lives. Her love as a sister in Christ, as a devoted mother, as faithful leader of youth and women, and as a precious friend will be cherished through out our time on this earth. The quick smile and easy laugh fill our memories, and the sweet knowledge that she is dancing with the angels consoles our grief. We are comforted by the assurance she is with the one she asked to be her Savior and Lord. Her testimony will continue to be that she touched our lives with the love of God. DeeDee we will miss you until that day when we are reunited. This whole thing still saddens me. ← Are three odd numbers evidence of a Creator? I’ve heard a lot about this case. I’ve heard the news reports and I’ve heard the ‘talk’. What I have heard is that DeeDee did not have a drinking problem. Too many women knew DeeDe to well for her to have gotten away with a serious drinking habit. As to Brian’s personality, I really don’t know. I didn’t know him well. I knw the Pastor of the church and he is devestated by what has happened. Moreover, there are people in the church who have said that they knew there were problems but didn’t think it was their place to say anything. If you want to address a problem, that’s the one to talk about. Church folk tend to put their pastoral staff in some kind of bubble. They aren’t treated like normal peple. It’s almost like royalty. Then we find out they have feet of clay. Wow. What a shocker. If you want to change something, stop acting like any pastor has all of the answers. They are just human beings like the rest of us. They just decided to accept responsibility for a higher purpose. I agree with you that no pastor has all the answers. I don’t think anywhere in my posts on this subject I have implied that they do–or should. And I agree with you that too many people probably let the warning signs slide. You are not the first to write to me (most privately) saying that they knew there were problems, but nobody ever expected Brian to kill DeeDee. That’s understandable. And, as you imply, that’s part of the problem. When the Church (the whole Church, not necessarily your church) takes seriously Christ’s call to discipleship and the need for true spiritual transformation I think a few things happen that diminish the risk for this kind of thing. For one, if Brian Golden had been truly spiritual transformed, it’s unlikely this would have happened. His behavior reveals a lack of transformation. Second, if the people around Brian Golden were truly heeding Christ’s call to discipleship, Brian would have been in a transparent mentoring relationship with other men who would have called him into accountability. And even without a mentoring relationship, since we are called to help others who are in sin, I imagine there should’ve been some sort of confrontation about Brian’s and DeeDee’s so-called “spats.” Dialog would have ensued, and perhaps some confession of sin. Now, I’m not accusing SSAG, its staff, or any of its members of not being true disciples of Christ. That’s not my point. However, what happened at SSAG is a reflection of the culture of the entire North American church. There is not enough transparency between believers. There is not enough mentoring and discipleship. There is not enough spiritual transformation. There is not enough confession of sins. That’s as likely true for SSAG as it is for my home church and anybody’s home church who reads this blog. For further evidence of my claims, just check out sociologist George Barna’s website at barna.org and follow his polls of North American Christians. The state of morality and spiritual transformation in the NA church is shockingly negative. We need to return to biblical discipleship. And, by the way, I include myself in that imperative. Brian pleaded guilty to murder on 10/17/06. I find it interesting that positions within churchs are filled by individuals with a troubled past. It seems that some churchs are so desperate to fill the void that they will use anyone who volunteers and bend the established rules when the need fits. Just because someone ask for forgiveness is no reason to place them in a position of authority. 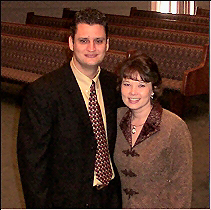 Brian Golden was not a member of the pastor’s family, as implied above. I can assure you that the pastor would have taken action if he thought Brian was anything but a Christian.